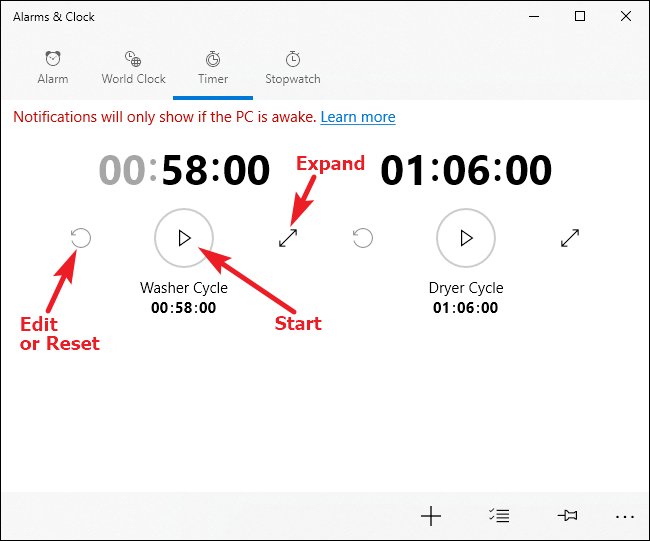 For whatever reason, Windows did not include alarms, timers, and stopwatches until Windows 8 rolled around. 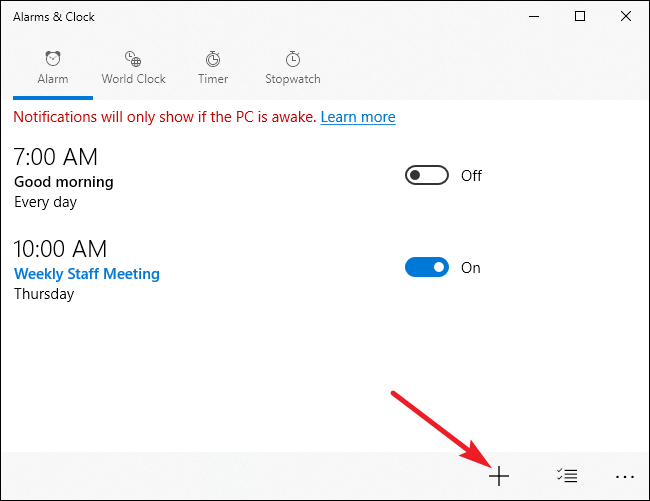 Windows 10 improves on those features, and this basic function now works much like it does on every other operating system out there. Alarms work exactly like you expect. You set a time (and days) for the alarm to go off, pick an alarm sound, give the alarm a label, and you’re off to the races. 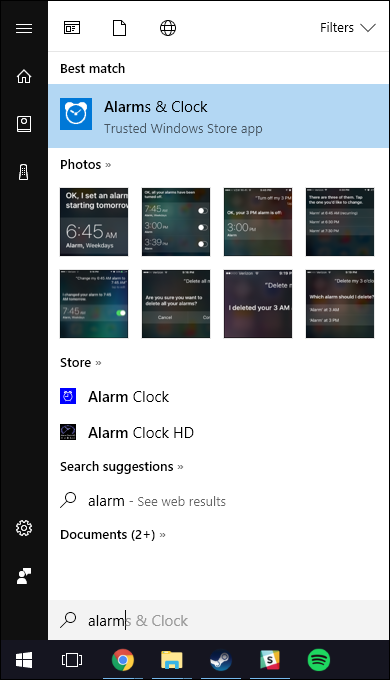 Hit Start, type “alarms” into the search box, and then click the “Alarms & Clock” result. You can turn alarms that already exist on and off by clicking the toggle to their right. 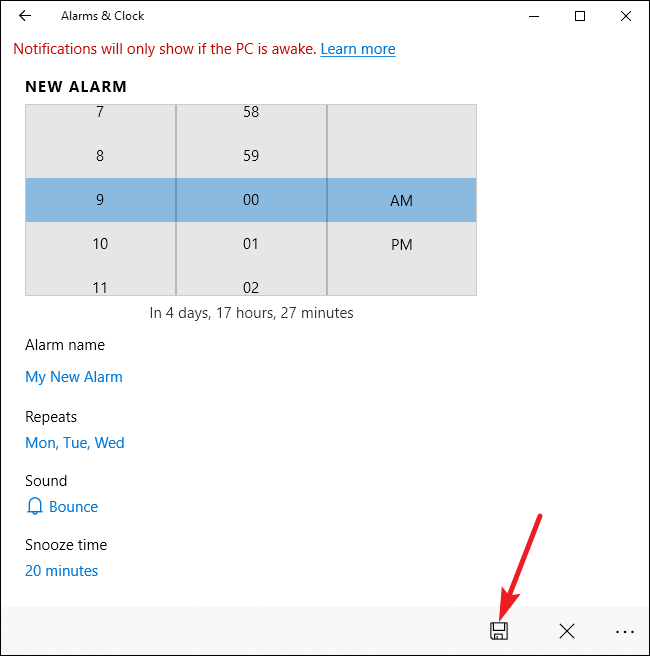 To create a new alarm, click the plus (+) button in the bottom right corner. 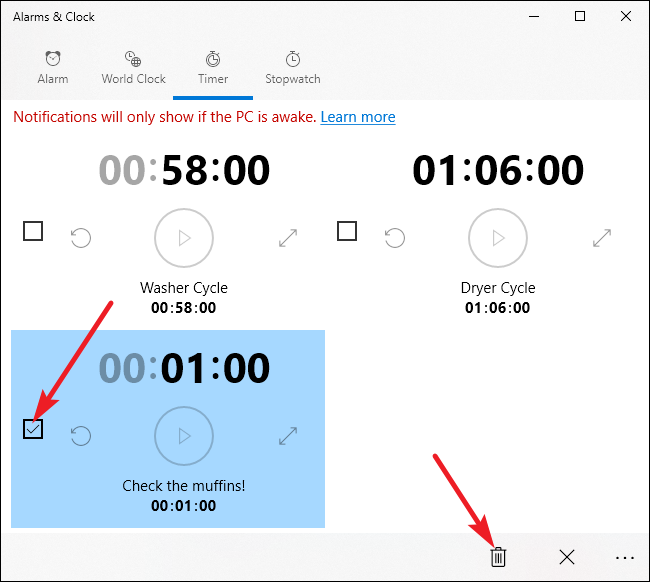 Use the scroll wheel to set a time, and then click the links under each of the remaining items to configure an alarm name, whether the alarm repeats (and on what days), the sound to use, and how long hitting the snooze button gives you. When you’re done, click the “Save” button. When you’re done, your new alarm is automatically enabled, but you can turn it on or off like any other alarm. 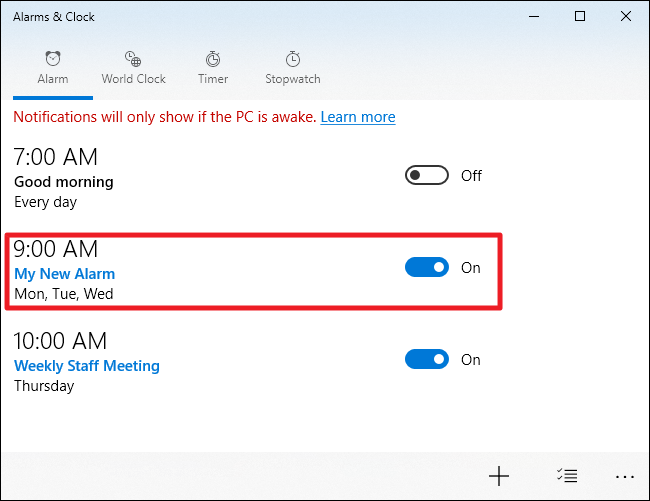 When your alarm goes off, you’ll receive a notification above the Windows system tray. 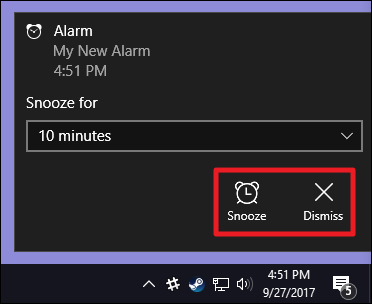 Click the “Dismiss” button to stop the timer sound or the “Snooze” button to snooze the clock for the preset amount of time. You can even use the dropdown to adjust the amount of snooze time you get. 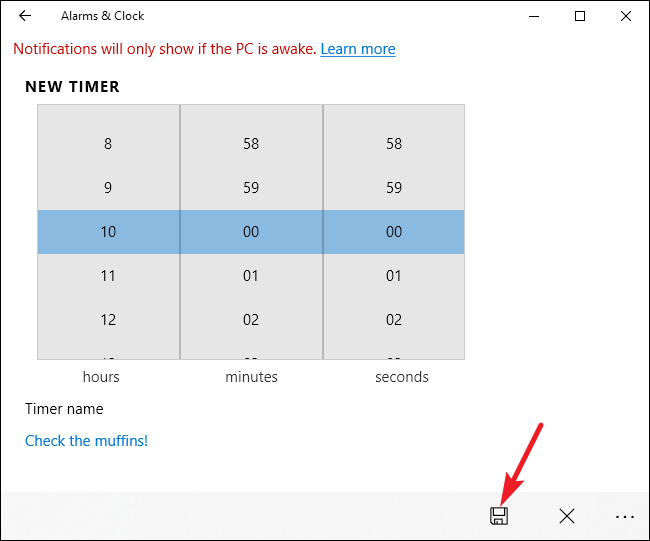 To delete an alarm, click the “Select Alarms” button in the bottom-right of the “Alarms & Clocks” window. Select the alarms you want to delete, and then click the “Delete” button. 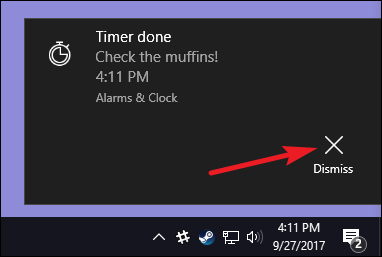 Timers are another welcome addition to Windows. 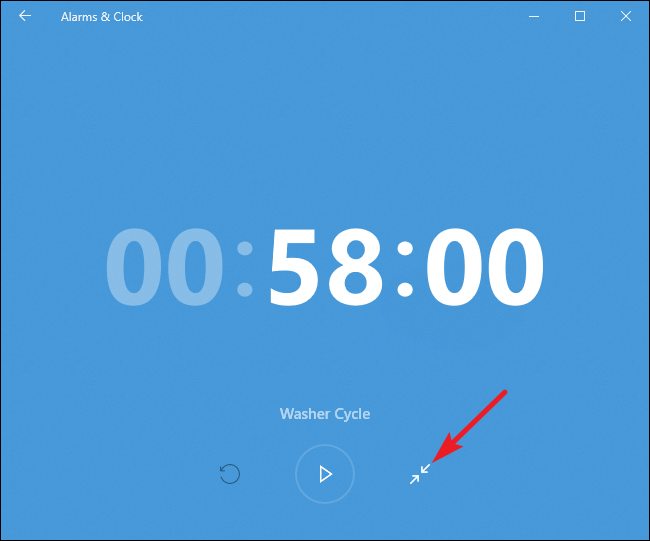 In the “Alarms & Clock” app, switch to the “Timer” tab. Here, you can see any timers you’ve already set up (or a default timer if it’s the first time you’ve visited the app). Click the “Play” button to start a timer. The “Reset” button serves a dual function. If the timer is not running, it opens an edit page where you can change the timer. If the timer is running, the “Reset” button resets the timer. 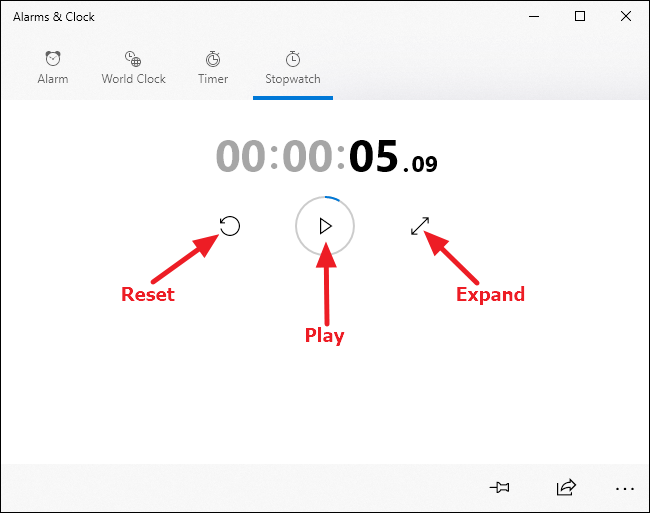 Clicking the “Expand” button (the double-headed arrow) expands the timer to fill the full screen, as shown below. Click the “Expand” button again on this screen to return to the normal view. To create a new timer, click the plus (+) button in the bottom right corner. Use the scroll wheel to set a time, and then click the link under “Timer name” to name your timer. Unlike with the alarm feature, you cannot set different sounds for different timers. When you’re done, click the “Save” button. 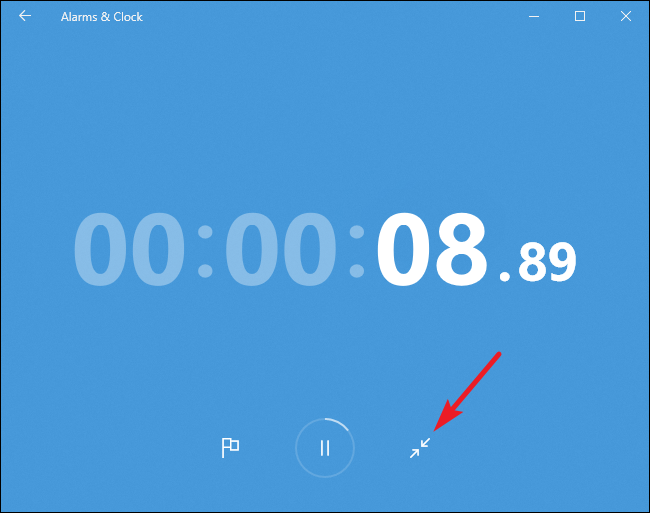 When your timer finishes, you’ll receive a notification above the Windows system tray. Click the “Dismiss” button to stop the timer sound. 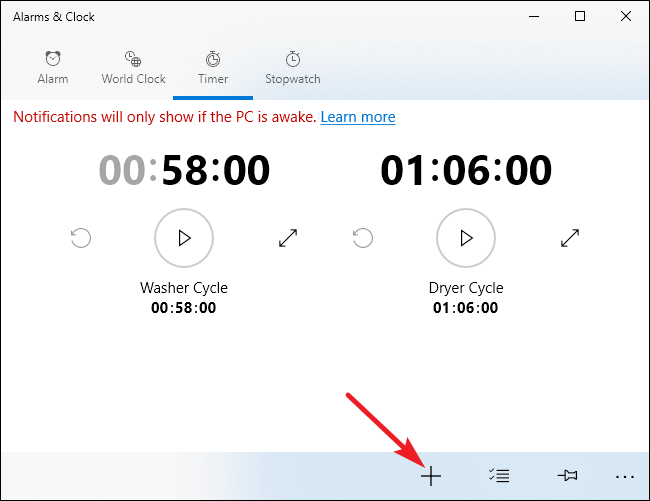 To delete a timer, click the “Select Alarms” button in the bottom-right of the “Alarms & Clock” window. Select the timers you want to delete, and then click the “Delete” button. The stopwatch is super simple to use. Unlike alarms and timers, you only have one stopwatch. While the stopwatch is stopped, you can click the “Reset” button to the watch’s left to reset the clock to 00:00. To start the watch, click the “Play” button. Clicking the “Expand” button (the double-headed arrow) expands the stopwatch to fill the full screen, as shown below. Click the “Expand” button again on this screen to return to the normal view. 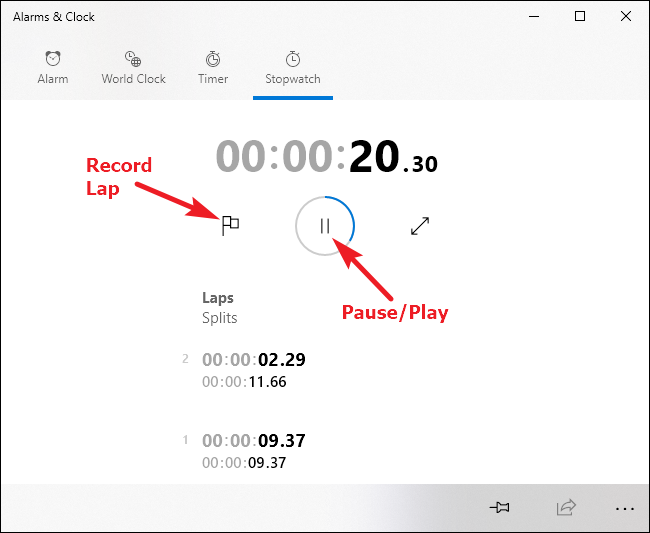 While the stopwatch is running, you can pause the watch, or click the flag icon to record a lap time while leaving the clock running. 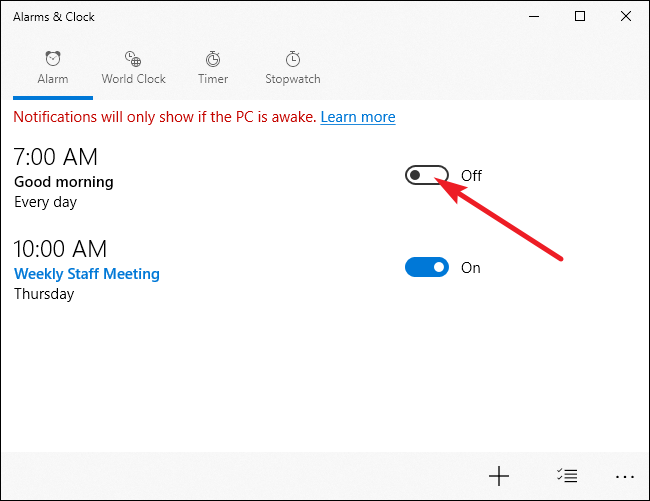 “Alarms & Clock” is a welcome addition to Windows. 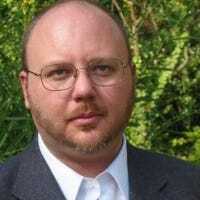 Unfortunately, it isn’t fully integrated into the system, which means that you still have to use it as a standalone app. 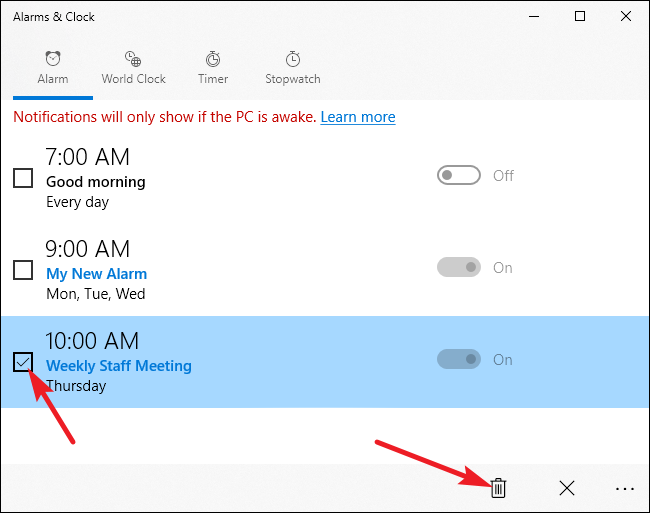 Therefore, you might want to pin it to the Start menu or taskbar if you plan to use it frequently.